Over the years I have gotten a fair number of inquiries from people living on lakes with horsepower restrictions. 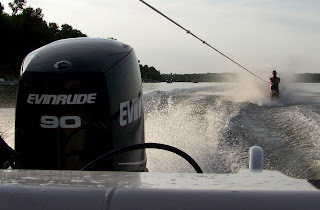 About four years ago I borrowed a new Evinrude 90 E-Tec from a local dealer for testing on the Dyna-Ski 17.6 Open Bow that I had at my house. Nothing special was done to the boat or motor for this test. 28 gallon gas tank was full. The 90 hp Evinrude E-Tec is a 3 cylinder 2 stroke motor weighing 320 lbs. This motor is pretty quiet and seems to be very fuel efficient. I had the motor installed with a pair of transom shims to give the driver more usable trim range. The gauges in the dash included a Livorsi GPS Speedometer. The first prop was a three blade stainless steel Viper 13 7/8" by 15". I was only able to hit 4500 rpms which was 42 mph on the GPS. This motor should be running 4500 to 5500 according to the folks from BRP so we were on the low end of the range and slow out of the hole. I did not further test this prop as it was not suitable for water skiing. With a little custom work it might be a good riding around prop perhaps? The testing was being hampered by not being able to trim the motor up while moving from the driver position. Down worked fine I just could not trim up once it was trimmed down from the driver seat. It is hard to believe that outboards in the past did not have power trim and tilt. Now we expect it on every motor. Second prop was a three blade 13 7/8 by 11". I took this prop off of my pontoon boat. 24 MPH at 5500 rpms. Great acceleration and very steady speed holding. The wife skied on her swivel ski which requires a solid and steady 16 or 17 mph. 4200 rpms was the perfect speed for her. I pulled my 7 year old son John in a tube by himself (and with mom) and he also knee boarded. Excellent for holding slow speeds no matter how slow he wanted to go. Also cruised around with three adults and John in the boat. Descent performance it just needs more top end. It took what seemed like a long time to run across 2400+ acre Lake Noquebay vs having a 150 on the back which is what I am used to but the gas gauge on the 28 gallon tank has still barely moved with the 90 out back. I pulled the boat out of the lake and fixed the motor trim problem. It took me a long time to find the pinched (and shorted) trim wire in the wiring harness under the motor cowl. The motor was installed by a local Evinrude dealer. While the boat was on the trailer I put on a 3 blade Stainless Steel 13 3/4" by 13" SSP Prop. Getting 5500 rpms was no problem. Little if any trim was needed. Motor had more RPMs available. Speed was 34 mph on the GPS at 5500 rpms. Acceleration was descent. Speed holding was excellent. Next was a 4 blade Stainless Steel 13 1/2" by 13 Rogue Prop. Getting 5500 rpms took some trim. Speed was 34 mph on the GPS. Acceleration was slightly less than the 3 blade. Speed holding was also excellent. Last was the 3 blade aluminum 13 1/2" by 15" standard prop. Getting 5500 took a fair amount of trim. Speed was 36 MPH on the GPS. Acceleration was slower than the two props above but better than the Stainless Steel 13 7/8" by 15" Viper. Speed holding was still real good. Next is the serious water ski testing. I borrowed a skier from the local water ski team (185 lbs male). He was the biggest kid there. My wife and son were in the boat with me. 225 lbs., 120 lbs. and 45 lbs. Gas tank was on 3/4 or slightly above. The new E-Tec 90 hp. motor now has 3 or 4 hours on it. I pulled the guy up deep water several times on a single wood water ski using a 85’ line attached to the standard ski pylon. It was a descent pull. I would not call it slow or fast. Remember the boat runs 36 mph on the GPS at 5500 rpm without a skier. I was able to trim up to get 5500 rpm and 36 mph on the GPS Speedometer with the skier behind the boat. He was footing at 35 mph so we lost one mph with him footing. He said the water was solid and the pull out fine. I wish that I would have had more time to fine tune the motor and prop combination a little. Perhaps a 3 blade Stainless Steel 13 3/4" by 14" prop would be better as the 13 3/4" by 13" had better acceleration but would only do 34 mph on the GPS at 5500 rpms. In summary the Open Bow 17.6 with a 90 hp motor surprised and impressed me with how well the small motor performed on the water ski boat! 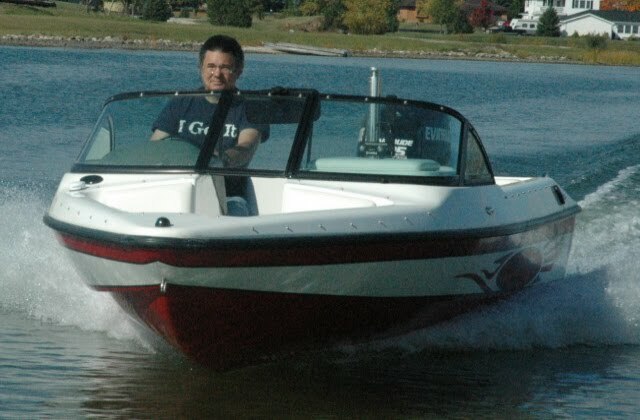 If a person is limited by lake rules or is on a real tight budget a 17.6 Open Bow with a 90 horsepower engine would make for a descent water ski boat. Some common sense is required though with a low horsepower water ski boat. You won’t be able to load the boat down with people and barefoot. If a person is willing to have a few different props and change them depending upon how they using the boat at the time the combination is even better. The nose of the boat stayed down with all motor and prop combinations.